There is always a greater power. Welcome to my kingdom. 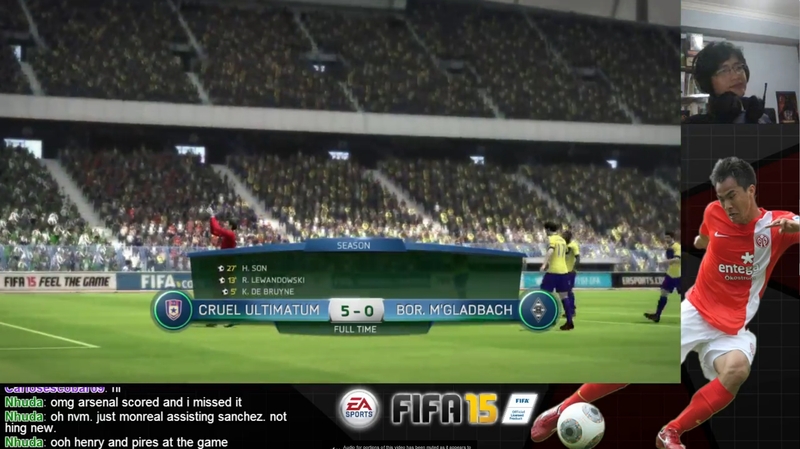 Update (12 Jan 2015): Added images of the 5-0 scoreline and Junior Malanda. Original: On my 29th birthday, I finally got the present I wanted: a Maya Yoshida In-Form (IF) card in FIFA 15. He’s only a Silver centre back with a rating of 73, but because of FIFA Ultimate Team’s (FUT) lopsided economy, he was grossly overpriced at 70k coins. I didn’t care, because it was my birthday, and I wanted to pair Yoshida together with Winston Reid’s IF card in the centre of the defence. And then, Mario Gotze and Robert Lewandowski both scored their first goals for my Bundesliga squad in the same match, right after I had criticised them. 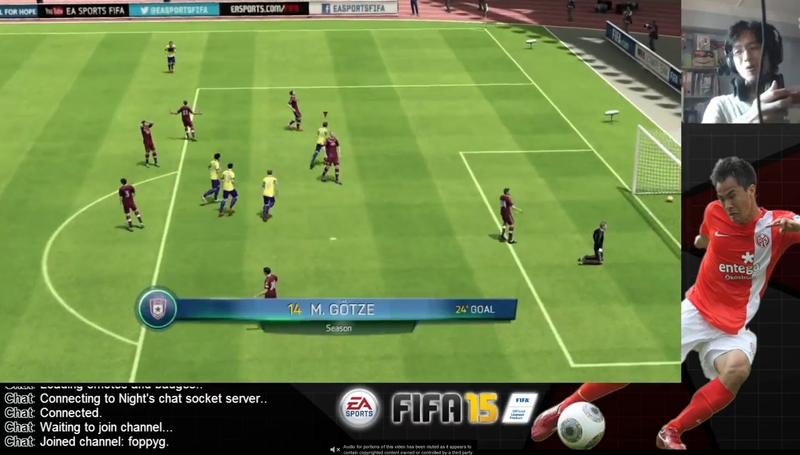 Gotze’s goal was a magnificent long range curler from outside of the box that gave the keeper no chance. It was an important, difficult match on World Class difficulty against Torino. We eventually won 2-0. Then earlier this morning on the train, I read the horrible news about Junior Malanda who died in a car crash in Germany. Malanda played for Wolfsburg, and I had three Wolfsburg players (Kevin De Bruyne, Sebastian Jung, and Diego Benaglio) in my Bundesliga team. I decided to honour Malanda by playing a couple of quick matches against the AI. I subbed Benaglio in for Roman Weidenfeller who is my usual goalkeeper, and I slotted De Bruyne in the leading Central Attacking Midfield role in place of Gotze. De Bruyne scored with a beautiful shot from the outside of his right foot (incidentally, it was also his first goal for my team), and Benaglio kept two miraculous clean sheets with some outstanding goalkeeping. Although I had to take De Bruyne off early in the second match because of an injury, he had already left his mark in the best way possible — by paying tribute to his fallen countryman with a goal. The match ended 5-0. I was quite speechless, it was as if everything had been preordained as De Bruyne, Benaglio, and everyone else played with all of their heart and soul. Even Adrian Ramos managed to score. I can’t believe I’m devoting my birthday to a group of digital football players. This is why we love the sport so much. 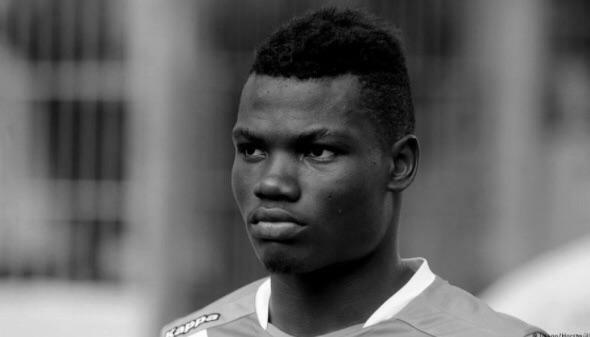 Rest in peace, Junior Malanda. You died on my birthday, and I hope you enjoyed the match from the spectator heavens above. Image of Junior Malanda taken from Klaas-Jan Huntelaar’s Twitter account. I rarely comment but I have to say something about this post: it moved me. Well said and well done. RIP Malanda. Playing videogames and reading about videogames consumes most of my free time. I try to play everything except for rhythm games. Also enjoys sports, animation, comics, Japanese language studies, and the occasional American TV drama. Learning violin.